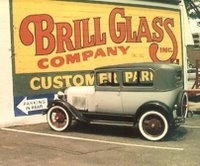 Thank you for visiting Brill Glass Company. We are a full service auto glass replacement company, conveniently located on East Broadway in downtown Louisville, Kentucky. We offer the highest in OEM quality replacement glass for your car, truck, street rod, heavy equipment…etc. If you can drive it, we can replace the glass in it. Please take a few minutes to look around and feel free to contact us with any questions or comments.